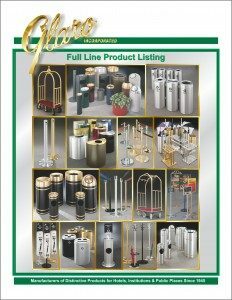 Glaro Inc.’s new Full Line Product Listing is an excellent resource for dealers looking to expand sales and reach new customers. It is an 8.5” x 11” full color, printable PDF available on the Glaro “Dealer Center” menu tab of the glaro.com website. Please note that Glaro Inc. is pleased to assist with dealer sales efforts by personalizing the Full Line Product Listing with their company name, logo, and contact information, free of charge. Upon request Glaro Inc. will remove the Glaro contact information. Glaro will provide the finished PDF so that it can be printed, e-mailed, or used online. E-mail the PDF to the prospective customer and use it as a reference tool when talking on the phone to quickly share and review the product lines. Ask Glaro Inc. to add your own logo, company name and contact information. 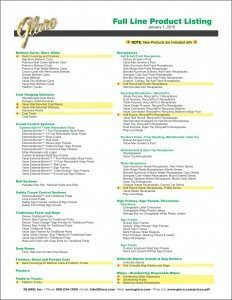 Then add the 2015 Glaro Full Line Product Listing to your website in a prominent location to promote awareness of your expanded line. Your customers should be able to download it and use it internally. Following a sales call, email the PDF to your prospect. It’s also a great resource to use as a thank you or follow up email. Once it is printed it can be handed out during sales calls or at conferences and trade shows. Ask Glaro Inc. to add your company name, contact information, and logo. We will send you a color, downloadable PDF that you can print at your office. Print the PDF and mail to your contacts with your direct mail campaign. Use this consolidated brochure as a checklist. Review the detailed listing with customers to help them make their product selections for the various locations in their building. Help customers realize that they can select different types of products and still select a finish to standardize on so that all products match throughout the facility. Include the Full Line Product Listing brochure in company email blasts. Email it to prospects and active customers who have contacted you for more information. Use the brochure internally to get everyone on your sales team updated about Glaro’s full product line. Delve deeper into specific product lines during training and access the pages of interest on Glaro.com. For more information, visit the Glaro Dealer Center online (https://glaro.com/product-literature/).